My blog today is a combined Surreal Trap Door and Eat this Book. Books about outdoor adventure and survival are my great favourite. At Bear Pond Books, Stowe’s wonderful book store, Ghosts of K2 by Mike Conefrey caught my eye. It reads like a thriller! It has a nasty track record. It has the second highest climber mortality rate for mountains over 8000 feet: 77 deaths for 300 summits or roughly 1 in 4 climbers die. The dubious title of ultimate killer belongs to Annapurna at 61 deaths for 191 summits or 1 in 3. Everest gets more publicity for its deaths but in fact, its fatality rate is relatively low: 54 deaths for 3000 summits. K2 got its name during the The Great Trigonometric Survey of British India. Thomas Montgomerie, perched on Mt. Haramuhk 200 km south of the Karakoram mountain range, sketched two prominent peaks and labelled them K1 and K2. K1 had a name, Masherbrum, but K2 didn’t, probably because of its remote and inaccessible location. Local people simply called it “Chogori” or Big Mountain so the name K2 stuck. Now for the opening of the surreal trapdoor! 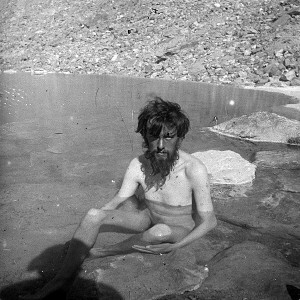 The first serious attempt on K2 was a 1902 British expedition led by the infamous occult leader, Aleister Crowley! At the time Crowley was a mop-headed, British gentleman of independent means, channelling his inner Alan Quartermain. Despite being hampered by lack of roads, modern equipment and an understanding of the devastating effects of high altitude on human physiology, his team managed to reach 21,407 feet. Miraculously no one died in the attempt despite the frigid temperatures and gale force winds. The team suffered considerable hardships. Crowley went 85 days without bathing and was plagued by malaria, lice and snow blindness. He was too ill to attempt the summit, which probably saved his life. He attempted one more big climb, Kangchenjunga, the third highest mountain in the world and third worst killer of mountaineers: about 22% die summiting its peak. After three of his team died in an avalanche, he gave up climbing over 8000 feet for good. Crowley’s interest in the occult and “magick” began in 1898 when he joined the Hermetic Society of the Golden Dawn. The occult and mysticism became the focus of his life. In 1905, he founded his own religion, Thelema. Throughout his life, he remained controversial because of his multitude of male and female lovers and his appetites for opium, heroin and cocaine. Some biographers believe that his libertine ways covered up the fact that he worked as a spy for British intelligence throughout his life. K2 was finally summited by an Italian team on July 31, 1954, a little more than a year after Hillary and Tenzing topped Everest on May 29, 1953. More understanding of the dangers of high altitude and bottled oxygen made these ascents possible. 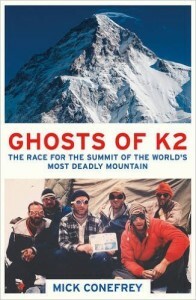 Mike Conefrey, the author of The Ghosts of K2, is a documentarian who has worked mostly with the BBC. His passions are mountaineering and exploration. He approaches writing non-fiction as a dramatist, which makes Ghosts of K2, a page-turner that stays with you. So, dear readers, EAT THIS BOOK! !